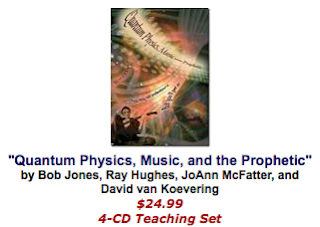 Herescope: "Sound of Heaven, Symphony of Earth"
for 4 CDs "Quantum Physics, Music and the Prophetic"
by David Van Koevering, Ray Hughes, Bob Jones, and JoAnn McFatter." We live in the “Information Age,” an age of increasing revelation, prophetic insight and sensitivity to the spirit realm.... We live in a time when science fiction can become science fact overnight.... I believe that the Holy Spirit has given me some pieces of the puzzle to heaven’s sound, so the information I share with you about sound and light and vibration will be based upon scientific fact, confessed speculation, and spiritual revelation. 1965 was the year when the film The Sound of Music was released. The movie’s theme song written by Oscar Hammerstein II (1895-1960), composed by Richard Rogers (1902-1979), and sung by actress Julie Andrews (1935- ), has for five decades remained a musical icon. “The hills are alive, / With the sound of music / With songs they have sung / For a thousand years,” go the song’s opening lyrics. 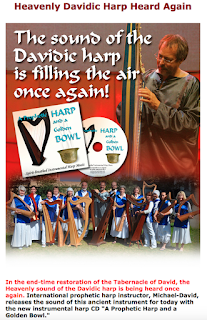 But according to Quantum Charismatics, not only are the hills alive with the sound of music, but also everything else God has infused with heaven’s “sound of many waters” (Revelation 14:2). This music, Quantum Charismatics believe, will bring revival to the church as it endows God’s “manifest sons” to interpret life even as mobilizes miraculous powers within them. 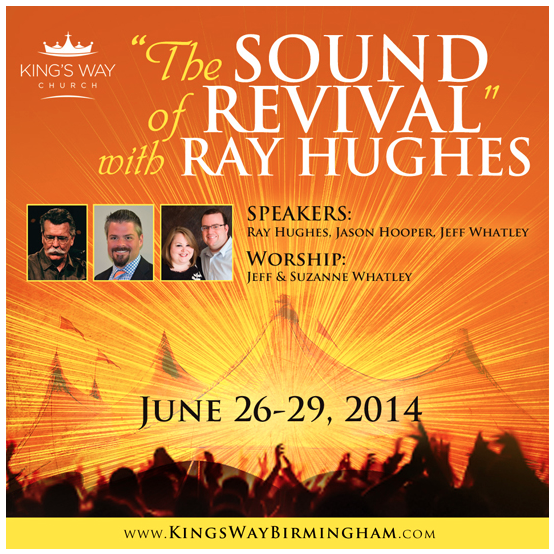 Ray Hughes illustrates how sound brings understanding to life, especially in the church. As in a motion picture, music provides meaning and creates feelings for what is seen. He refers to a movie portraying a nattily dressed woman walking hurriedly down a sidewalk on a crowded city street. Various types of accompanying music might offer different interpretations of the woman’s situation. Is the accompanying music depressing? If so, viewers could be impressed that the woman is in some kind of trouble. Is the music upbeat? Viewers would conclude she’s not in danger, but only taking a daily exercise walk. Is music romantic? Viewers might interpret that she is hustling to meet her boyfriend at Starbucks. Hughes’ point is that sound “can create a story from dry facts. It [sound] causes our emotions to go beyond facts to feelings.”(TPOH, 69) In Hughes’ view, sound gives meaning to sight. So music or sound becomes a key for interpreting the experience of life in the church. Music, says the author, impacts prayer, faith and activity in the church. (TPOH, 69) Sound can enhance if not determine spirituality. Reverbs can create revival. To this point, Hughes informs readers that, “With every revival, there has been a release of new music or sound.”(TPOH, 69) He then goes so far as to suggest that, “Whether the music releases the revival, or whether the revival releases the music varies from generation to generation.”(TPOH, 69) Hughes compares the issue to be like asking the old question of what comes first, the chicken (the revival) or the egg (the music). The right music creates the atmosphere of worship and facilitates a working of signs and wonders. 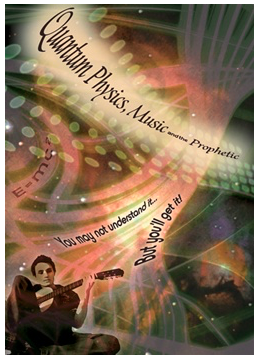 This theory of sound or music—primordially infused by God into nature’s elements—drives, as Hughes states, the Quantum Charismatic view of spiritual life. We turn to summarize and look at the theory the author espouses. God is light/sound (“Although light and sound are located on different frequencies, they are the same thing.”(TPOH, 66) When God said, “Let there be light,” He “released” and infused His sound-music into three of the four elements which ancients believed comprised the universe—water, wind and fire. The three elements began to Quantumly vibrate with heaven’s music, “the sound of many waters.” But nature’s fourth element, earth, was lifeless until... God took earth/dirt, made Adam and animated him with sound/soul. The first sound Adam ever heard was God breathing His music into him. Because humans have sound/soul—unlike wind, fire and water which possess sound only—they possess a will. 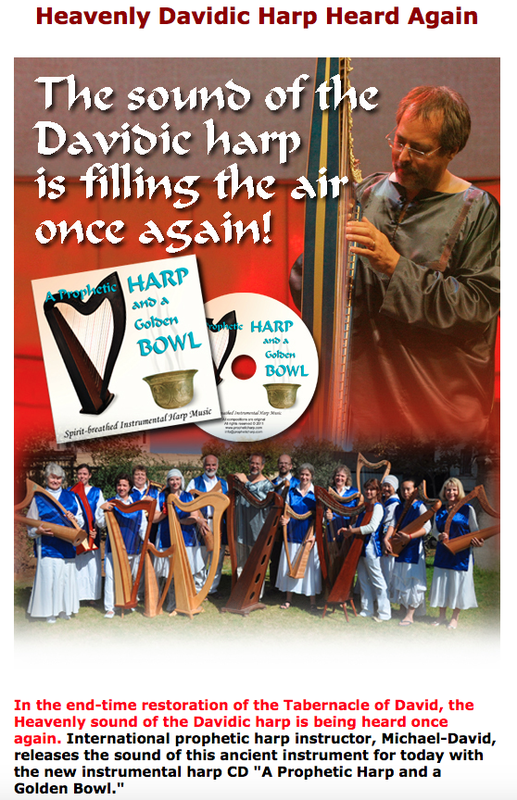 So with their will/soul, humans can choose to align themselves with the music of heaven to connect with the “creative ability [power] to release the sound of God” (e.g. to perform miraculous signs and wonders). The coming of the second Pentecost will “light-up” and amp-up Charismatics with “creative ability” to do greater miracles than they’re doing today. "We plan to go into uncharted territory. We will embark on a journey to explore the mystery of color, light and sound. This road has been traversed by scientists and mystics alike. and is designed to release divine creative destiny." Which some professing have erred concerning the faith. The Bible indicts the idolatrous nature of speculation(s). Scripture prohibits a speculative approach to understanding God and spirituality. 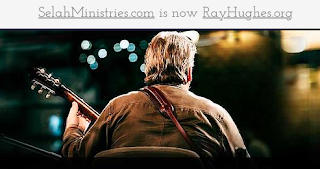 Yet despite the biblical censure of it, Ray Hughes admits the information he will share about “the puzzle to heaven’s sound... will be based on... confessed speculation....”(TPOH, 65-66). In other words, the puzzle he claims to put together about the way inter-dimensional sound (heaven to earth, and earth to heaven) determines true spirituality is speculative. Speculation can mean, “To meditate on a given subject” or “to engage in buying or selling of a commodity with an element of risk.” The former sense of the meaning of speculation—to meditate on a given subject—appears to be the sense in which the author employs the word, though his speculations could prove to be quite “risky” as regards the Christian faith, for imagination spawns idolatry. David van Koevering and JoAnn McFatter. In describing the devolution into paganism, the Apostle Paul wrote to the Romans that “though [pagans once] knew God, they did not honor Him as God or give thanks, but they became futile in their speculations, and their foolish heart was darkened. Professing to be wise, they became fools” (Emphasis added, Romans 1:21-22). The word “speculations” (Greek, dialogismos) is variously translated as “imaginations” (KJV), “thoughts” (NKJV), “thinking” (NRSV) and “reasonings” (ASV). What’s evident in this verse’s teaching is that speculating about God does not lead a person to God, but away from Him. The place to begin one’s search for God is not from inferences based upon sci-fi or sci-fact, but in God’s revelation, to be sure His revelation of himself in nature, but also necessarily confirmed by Scripture and Jesus Christ. The Apostle also wrote of a key mindset in which spiritual warfare is to be conducted. In waging that war, the Apostle writes that, “We are destroying speculations (Greek, logismos) and every lofty thing raised up against the knowledge [science] of God, and we are taking every thought captive to the obedience of Christ” (Emphasis added, 2 Corinthians 10:5). Furthermore, Paul told Timothy while he ministered at Ephesus to “instruct certain men not to teach strange doctrines, nor to pay attention to myths and endless genealogies, which give rise to mere speculation rather than furthering the administration of God which is by faith” (1 Timothy 1:4). Then again the elder exhorts the younger, “But refuse foolish and ignorant speculations, knowing that they produce quarrels” (2 Timothy 2:23). The point is clear. Speculation disconnects imaginers from the genuine Christian faith (Jude 3). Yet to validate his epistemological gimmicks for promoting his view of spirituality sourced in sound, the author informs readers that he has received revelations that confirm his speculations! release the sound of Heaven in each of our own communities." To buttress his revelation, the author window dresses his speculations with Scripture references. For example, as he conjectures about how “sound” relates to the Christian’s union with Christ—“Christ in you, the hope of glory”—he theorizes; first, that the word “‘glory’ means ‘lightified’... the hope of being ‘lit,’ or the hope of being ‘sounded’”; second, that the indwelling Christ is awaiting the moment when our sound will gloriously coalesce with His; and finally, that as His instruments, we will be played in a unified and deafening crescendo of praise to God. (See Colossians 1:27.) In short, we will be as New Age Religion puts it, “illuminated.” So as is true of most false teaching, truth and error are mixed (i.e., the word “glory” might be described as “lightified,” but not for the purpose Hughes proposes). 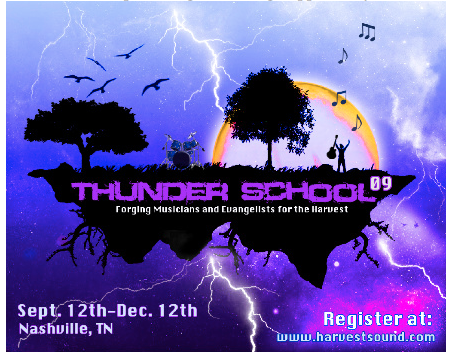 Thunder School conference advertised on TheElijahList, 7/27/09. 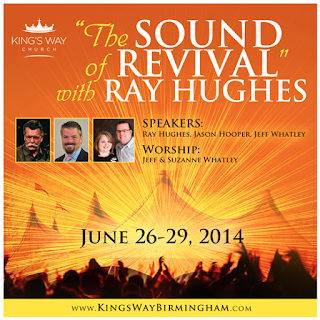 Speakers included Lou Engle, Bob Jones, Rick Joyner, Dr. Michael Brown, and Ray Hughes. when an army of worshiping warriors would be released...."
Read: "James Ryle's Vineyard Theology." WN is a variegated and complicated category of sound. Within the sound spectrum, it refers to “Acoustical or electrical noise in which the intensity is the same at all frequencies within a given band.” In popular parlance, WN can refer to random talk without meaningful or decipherable content. It’s called “white” because it lacks the distinctions of color, and noise because of the difficulty in deciphering it. "We have stepped into a NEW day and with this NEW day is coming not only a NEW Sound,"
as we look ever toward the horizon of this New Day Dawning...."
As such, not only are certain sounds music ultimately mystical, but can also become addictively manipulative, something worship leaders of mega-churches are aware of. They capitalize on the emotional “wants/needs” of the audience. The common experience of music creates a counterfeit unity and feelings of revival among worshippers as they revel around the same sound. Successful architect Jonathan Rivers’ peaceful existence is shattered by the unexplained disappearance and death of his wife, Anna. Jonathan is eventually contacted by a man, who claims to be receiving messages from Anna through EVP (Electronic Voice Phenomenon). At first skeptical, Jonathan then becomes convinced of the messages’ validity, and is soon obsessed with trying to contact her on his own. His further explorations into EVP and the accompanying supernatural messages unwittingly open a door to another world, allowing something uninvited into his life. 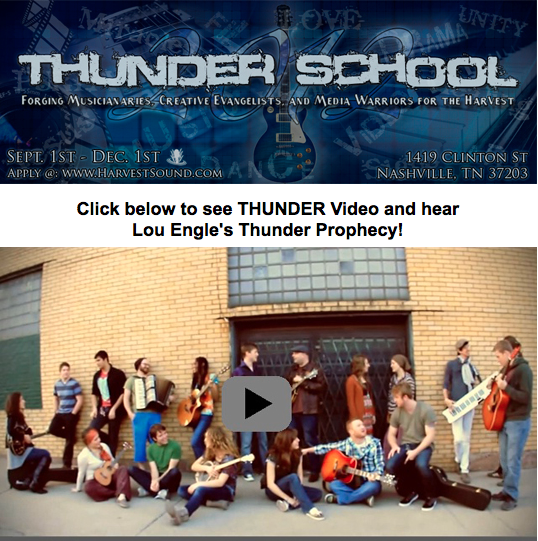 Another Thunder School event similarly advertised 6/29/2010 on TheElijahList. "God is calling us to bring His worship, His sounds and His colors to the streets!" and His face shone like the sun, and His garments became as white as light. heaven when we were with Him on the holy mountain. Emphasis added, 2 Peter 1:17-18. Sound here, sound there, everywhere a sound, sound! The myth Ray Hughes creates about sound (i.e., “the pieces of the puzzle to heaven’s sound” which the Holy Spirit revealed to him) presents a panentheistic concept of God, that divine sound permeates the whole of nature therefore “sacredizing” everything. This becomes evident in the speculations he makes and the revelations he has been given (or so he claims). We follow two strains of his argument indicating this. Contra Jesus, Hughes unites the world above (God’s reality) and the world below (our reality) with sound being the common and permeating denominator of the whole. This is indicated by his statement that, “Everything that God has ever brought forth has come from His creative voice—the same voice which impregnates the earth with light, sound, music, glory, the elements of God.”(TPOH, 66) Based upon this premise he therefore postulates that, “We are continually in the presence of ultrasonic [waves of sound “above” our threshold of hearing] and subsonic [waves of sound “beneath” our threshold of hearing] sound waves.”(TPOH, 68) He argues that just because we can’t see or hear the sound (kind of like sensing God’s omnipresence) does not mean it’s not there. This view of reality—as above, so below—is called Hermeticism. (see links at the bottom of this article). "spirit changing level of higher bandwidth and God consciousness." You have... one God and Father of all, who... is present in all. Everything you are and think is permeated with Oneness. With His words, Jesus declared that He and the Jews “emerge from two entirely antithetical realms,” and that, “An abyss separates them from Him.” Eternal heaven and temporal earth are two separate realities. This worldview contrasts to Liberal-Emergent and Quantum-Charismatic spiritualities which hold that the entire of reality—time and eternity, heaven and hell, light and darkness—is one. According to Jesus the sum of reality is not one. To believe so obliterates the distinctiveness of the Christian faith—that the eternal God is holy and separate from His temporal creation, that good and evil are opposite moral categories (There is sin. ), that heaven and hell separately exist, and that Jesus came from a reality eternally separate from earth. That God’s sound-light (Hughes views sound and light as identical) permeates everything, it’s necessary for light to have been in, with and around man from time immemorial. Twice Hughes proposes this to have been the case. for their deeds were evil. and does not come to the Light for fear that his deeds will be exposed. The myth created by Hughes’ imagination, speculation and revelation wrecks havoc upon Scripture’s otherwise plain meaning and the good theology which derives there from even as his scenario introduces relativity into the nature of God and begs questions about the literalness of the biblical account of creation, man’s fall into sin and God’s plan of redemption. Ray Hughes at a "Worship Encounter Conference"
Christian believers ought to be aware of and appreciate deeply the truth of their union with the Lord Jesus Christ; that positionally, they are in Christ (Romans 16:3, 7, 8, 9, 10, 11, 12, 13), and that experientially, the Spirit of Christ lives in them (Galatians 2:20; Romans 8:10-11). Appropriated and experienced by faith, this union—exhibited by the fruit and filling of the Spirit (Galatians 5:22-25; Ephesians 5:18-6:9)—remains an unrevealed mystery. For the time being, our lives are “hidden with Christ in God” (Colossians 3:3). But when Jesus comes again, that will change. Our lives will no longer be hidden with Christ, but exhibited with Him. When “Christ, who is our life, is revealed,” then we too will be “revealed with Him in glory” (Colossians 3:4; See Philippians 3:20-21). When that revealing will take place, God will offer empirical proof of every believer’s identity in Christ to the world, and it will not be a matter of sound, but sight! At that moment every Christian from Pentecost will glow with the glory of the Lord Jesus Christ when they are raptured-resurrected by Him (Matthew 13:43; Compare Daniel 12:3.). The myth Ray Hughes creates via the imaginations he conceives, the speculations he engages and revelations he receives, diminishes the New Testament’s expectation regarding the Second Coming of Christ. Instead of looking for the Son, Hughes encourages readers to listen for “the sound.” Yet regarding the report he heard of the conversion of the Thessalonians, the Apostle Paul marveled “the word of the Lord [had] sounded forth from [them]” (Emphasis added, 1 Thessalonians 1:8) as they had “turned to God from idols to serve a living and true God” (1 Thessalonians 1:9). But as “the word of the Lord sounded forth from them” the Thessalonians were waiting for the coming of God’s “Son from heaven” (1 Thessalonians 1:10). These early believers were not waiting to hear the sound announcing a second Pentecost, but the sight of the coming of the Son accompanied with “a shout, with the voice of the archangel and with the trumpet of God” (1 Thessalonians 4:16). With all the Charismatic emphasis upon the myth of a coming second Pentecost and the revival created by the new music, what becomes lost is the plain teaching about Jesus’ Second Coming (not a second Pentecost). The Charismatic expectation to be “lightified” (as stimulated by the sound of music) by the indwelling Christ has replaced the expectation of His coming physical presence from above. As a result, the hope of Jesus’ return and believers being glorified with Him becomes unnecessary. Until He comes again, we need to “watch out that the light in you is not darkness” (Luke 11:35). The 5th Thunder School advertised on TheElijahList, 4/18/12. 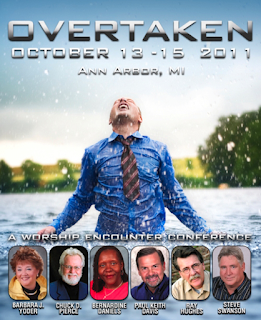 This ad links to Lou Engle's "prophecy"
that would be more powerful than the Beatles and fill stadiums with New Breed youth. Read: "The Significance of Youth-Filled Stadiums"
 Ray Hughes, Chapter 7: “Sound of Heaven, Symphony of Earth,” The Physics of Heaven: Exploring God’s Mysteries of Sound, Light, Energy, Vibrations and Quantum Physics, by Judy Franklin & Ellyn Davis (Crossville, TN: Double Portion Publishing, 2012): 65-75. Julie Andrews, “The Hills are Alive” from “The Sound of Music,” (http://www.lyricsmania.com/the_hills_are_alive_lyrics_julie_andrews.html). See Larry DeBruyn, “Getting ‘High’ on God: Inner Opiates and the Genius of the Megachurch ‘Experience’,” Guarding His Flock Ministries, September 6, 2012 (http://guardinghisflock.com/2012/09/06/getting-high-on-god/#more-2212). Webster’s II: New College Dictionary (Boston, MA: Houghton Mifflin Company, 1995): 416. During the Northern Chinese Famine of 1876-1879 when it is estimated that 9-13 million people died, “crowds flocked to the temples to entreat the Higher Powers. Theatricals were staged, to propitiate hard-hearted gods, whose images were carried out into the open street and respectfully enthroned where the best view could be obtained of the stage. Processions were daily made to wayside altars and city shrines, led by Taoist devil-worshippers, frantic with excitement, or mediums under the influence of spirit-possession.” See Mrs. Howard Taylor, Pastor Hsi: Confucian Scholar and Christian (London, GB: China Inland Mission, First Published 1900): 21-22. Testimonies of experiences of sights like this, historical and contemporary, can be multiplied. “White Noise (film),” Wikipedia: the Free Encyclopedia (http://en.wikipedia.org/wiki/White_Noise_%28film%29). “WHITE NOISE (2005),” Rotten Tomatoes: Movie Info (http://www.rottentomatoes.com/m/white_noise/#). W.H. Griffith Thomas, Studies in Colossians and Philemon (Grand Rapids, MI: Baker Book House, 1973): 66. Likewise, Harris writes that, “the indwelling of the exalted Christ in individual believers is their assurance of coming glory.” See Murray J. Harris, Colossians & Philemon: Exegetical Guide to the Greek New Testament (Grand Rapids, MI: William B. Eerdmans Publishing Company, 1991): 72. Glenn Alexander Magee, Hegel and the Hermetic Tradition (Ithaca: Cornell University Press, 2001): 13. See Larry DeBruyn, “‘Deliteralizing’ the Bible, from Plato to Peterson: Scripture amidst the Shadows,” Guarding His Flock Ministries, March 1, 2012 (http://guardinghisflock.com/2012/03/01/deliteralizing-the-bible-from-plato-to-peterson/#more-2038). Emphasis added, Eugene H. Peterson, The Message: The Bible in Contemporary Language (Colorado Springs: NavPress, 2002): 1337. Emphasis mine, Eugene H. Peterson, The Message / / Remix (Colorado Springs: Navpress, 2003): Ephesians 004:4-6, 2127. D.A. Carson, The Gospel According to John (Grand Rapids: William B. Eerdmans Publishing Company, 1991): 342. Frederick Louis Godet, Commentary on the Gospel of John, Volume II (Grand Rapids: Zondervan Publishing House, 1881): 98. Of the difference between Jesus and the Pharisees, Westcott wrote: “He and they belonged essentially to two different regions; the spring of their life, the sphere of their thoughts, were separated from the spring and sphere of His by an infinite chasm.” See B. F. Westcott, The Gospel According to St. John (Grand Rapids: Wm. B. Eerdmans Publishing Company, 1950) 130. Larry DeBruyn, “On Theosis, or Divinization: What does it mean to be ‘partakers of the divine nature’?” Guarding His Flock Ministries, January 11, 2012 (http://guardinghisflock.com/2012/01/11/on-theosis-or-divination/#more-1989). and Dr. Orrel Steinkamp's article: A Second Pentecost? and "THE RESTORATION OF DAVIDIC WARFARE/WORSHIP"
For more background, see: "The Significance of Youth-Filled Stadiums" and read: "James Ryle's Vineyard Theology."